PARIS (Reuters) – The global climate summit in Paris agreed a landmark accord on Saturday, setting the course for a historic transformation of the world’s fossil fuel-driven economy within decades in a bid to arrest global warming. 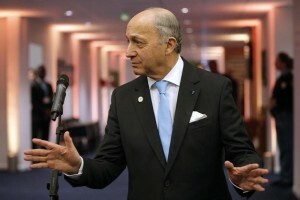 After four years of fraught U.N. talks often pitting the interests of rich nations against poor, imperilled island states against rising economic powerhouses, French Foreign Minister Laurent Fabius declared the pact adopted to the standing applause and whistles of delegates from almost 200 nations. “With a small hammer you can achieve great things,” Fabius said as he gavelled the agreement, capping two weeks of tense negotiations at the summit on the outskirts of Paris. The final agreement was essentially unchanged from a draft unveiled earlier in the day, including a more ambitious objective of restraining the rise in temperatures to “well below” 2 degrees Celsius above pre-industrial levels, a mark scientists fear could be a tipping point for the climate. “This agreement establishes a clear path to decarbonize the global economy within the lifetimes of many people alive today,” said Paul Polman, the CEO of consumer goods maker Unilever and a leading advocate for sustainable business practices. It will “drive real change in the real economy”. While some climate change activists and U.S. Republicans will likely find fault with the accord – either for failing to take sufficiently drastic action, or for overreacting to an uncertain threat – many of the estimated 30,000 officials, academics and campaigners who set up camp on the outskirts of Paris say they see it as a long overdue turning point. In a win for vulnerable low-lying nations who had portrayed the summit as the last chance to avoid the existential threat of rising seas, nations would “pursue efforts” to limit the rise in temperatures to 1.5 degrees Celsius, as they had hoped. And for the first time, the world has agreed on a longer-term aspiration for reaching a peak in greenhouse emissions “as soon as possible” and achieving a balance between output of manmade greenhouse gases and absorption – by forests or the oceans – by the second half of this century. It also requires rich nations to maintain a $100 billion (£65.72 billion) a year funding pledge beyond 2020, and use that figure as a “floor” for further support agreed by 2025, providing greater financial security to developing nations as they wean themselves away from coal-fired power. 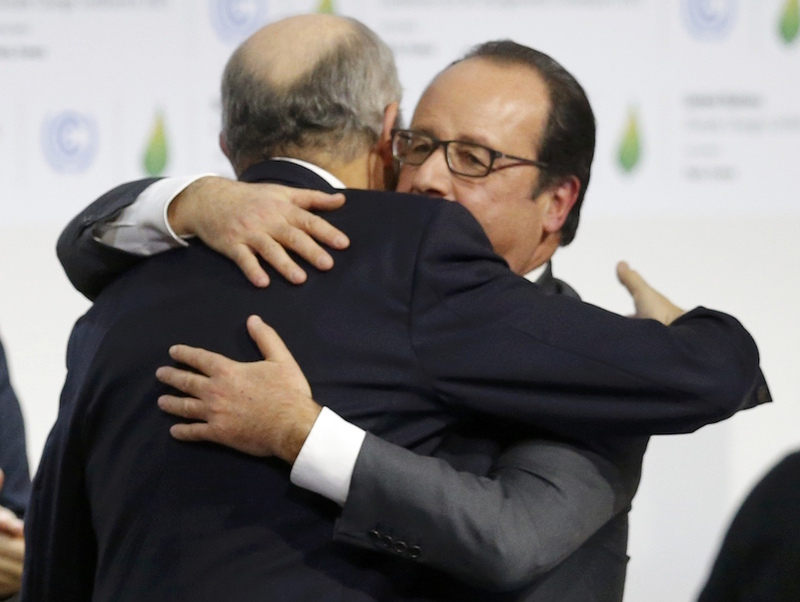 PARIS (Reuters) – After four years of global negotiations, two weeks of intense talks and more than a few sleepless nights, climate officials from almost 200 nations meeting in Paris are on the cusp of a landmark accord to arrest climate change. On Saturday, hosts France released the final text of a “Paris Outcome”, this one devoid of the bracketed text that represented the sticking points yet to be resolved. Written in the opaque legal language that has evolved from more than two decades of U.N. climate talks, the pact sets the world a roadmap for breaking away from the fossil fuels that have powered the global economy since the Industrial Revolution. The new text is 31 pages, against 27 on Thursday and more than 50 at the start of the talks. National delegations have broken up to review the text, with hopes high that they will return to a formal session to adopt it later on Saturday. Enshrining that figure in legal language was one of the biggest sticking points of the talks as delegates said the U.S. Congress could never ratify a commitment for developing nations to keep on increasing that figure from 2020. In non-binding decisions that accompany the binding text, the agreement says governments shall set by 2025 “a new collective quantified goal from a floor of $100 billion per year, taking into account the needs and priorities of developing countries”. In 2010, the U.N. climate summit in Mexico adopted a goal of keeping global temperatures from rising more than 2 degrees Celsius (3.6 Fahrenheit) above pre-industrial times, a level that scientists say could be a tipping point for the climate. Global average surface temperatures have already risen by about 1.0 Celsius (1.8 Fahrenheit). But many vulnerable, low-lying nations like the Marshall Islands say that a full 2 degrees Celsius rise would endanger their very existence as sea levels rise, and pushed hard for setting a goal to limit the temperature increase to 1.5 degrees Celsius. They found support from more than 100 nations, including the European Union and the United States, which formed a “high ambition coalition”. Saudi Arabia and other nations resisted, saying there was insufficient research to support a tougher target and that setting too ambitious a figure could endanger food security. The final draft text sets an aim to hold the increase in the global average temperature to “well below 2 degrees Celsius above pre-industrial levels”. It also seeks to pursue efforts to limit the temperature increase to 1.5 degrees Celsius above pre-industrial levels, recognising that this would significantly reduce the risks and impacts of climate change. Negotiators have struggled with how to phrase an aspirational longer-term goal for halting emissions, a symbolic but still potent message about how they see the world’s energy system transforming over the rest of this century. Some of the most vulnerable nations and non-governmental organisations had campaigned for a clear, quantified goal for eliminating or reducing fossil fuel use by the middle of the century. China and India, heavily dependent on coal, are among those reluctant to set clear dates for giving up fossil fuels they see as vital to lifting millions from poverty. Saudi Arabia, whose economy also depends on oil, is also a clear opponent. The European Union, although keen to lead on climate had a problem with the word decarbonisation because of Poland, whose economy depends on coal. As negotiations wore on, the options grew vaguer. By Thursday evening, the goal was greenhouse gas neutrality, a phrasing that confounded some climate experts, but avoided the word decarbonisation. The final text said nations must “aim to reach global peaking of greenhouse gas emissions as soon as possible, recognising that peaking will take longer for developing country parties”. It said that to achieve the long-term temperature goal set out by the deal, parties will aim to achieve a balance between anthropogenic emissions by sources and removals by sinks of greenhouse gases in the second half of this century, on the basis of equity, and in the context of sustainable development and efforts to eradicate poverty. 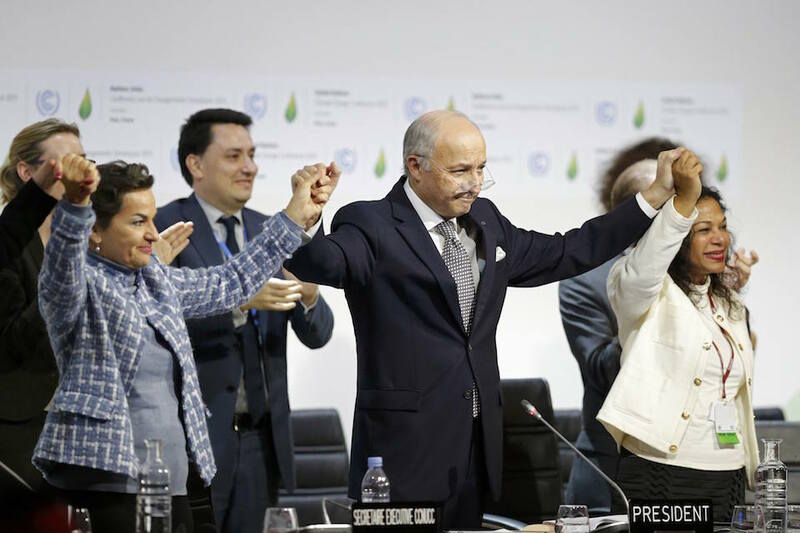 Analysts at the talks interpreted the text as implying net zero emissions. Developing nations want a long-term mechanism to help them cope with loss and damage from disasters such as typhoons or the impacts of a creeping rise of sea level rise. All governments set up a loss and damage mechanism in 2013, but it has so far done little. Earlier drafts recognised the importance of averting, minimising and addressing loss and damage, but offered divergent options, including one that left out the mechanism. An existing international mechanism to deal with the unavoidable losses and damages caused by climate change, such as creeping deserts and rising seas, is anchored in the draft final deal. A promise that it will not be used as a basis for “liability and compensation” — a demand from the United States that proved divisive — has been moved to a set of accompanying decisions in a compromise. Well before the Paris talks began, it was clear that the promises made by 186 nations to curb greenhouse gas emissions beyond 2020, the backbone of the Paris accord, were too weak to limit rising temperatures to the agreed 2 degrees Celsius level. Negotiators knew going in there would have to be a system for “ratcheting up” national measures, but how and when to do that has been a sticking point throughout. Frequent reviews have been a major demand from negotiating blocs such as the European Union, but China in particular said it cannot commit to more aggressive action quickly because Beijing has already set domestic goals out to 2030. In line with a date mooted in the previous draft on Thursday, the new draft text schedules a “first global stocktake in 2023” and every five years thereafter unless otherwise decided. The draft legal text contains no explicit mention of carbon markets, nor of the possibility of carbon penalties for aviation and shipping. It does, however, include a reference to the “use of internationally transferred mitigation outcomes,” which could allow nations on a voluntary basis to offset their own emissions by buying credits from other nations. The new text says developed countries shall provide financial resources to assist developing countries and “other parties are encouraged to provide or continue to provide such support voluntarily”.